The DP024 is a fully compliant ATX power supply designed to power a low power system from a single 24V power source of a vehicle. The DP024 power supply has an MCU that controls and monitors various functions of the power supply operation. Also, it realizes voltages monitoring, temperature monitoring and communication via COM-port with computer. As well the MCU realizes a WatchDog timer to supervise the computer. A LED indicator continually reports the power system status and health. Also, you can use it for troubleshooting. Notwithstanding the fact that the DP024 can operate without active cooling it realizes a hardware-firmware device for a temperature-based automatic-fanspeed control of two fans. Reducing of the fan speed as the temperature drops minimizes the system acoustic noise, prolongs fans service life period, diminishes power consuption. The use of two fans that has been controlled by DP024 allows to build a system with redundant cooling facilities and allows to design fault-tolerant system with long-life performance. For operating at low temperature the DP024 can act as thermostat with heating. There are four main operating modes of the DP024 - Deep Sleep, Sleep, Standby, Power On. The DP024 has user selectable MCU driven timing settings, allowing you to choose various ignition/shutdown vehicle computer timing schemes (settings). These settings are user adjusted and saved in EEPROM. One of most difficult tasks of operating a computer in a vehicle is power consumption while the computer is OFF. Even if your computer is totally OFF (standby mode), a computer will still consume a few hundred milliwatts, needed to monitor computer ON/OFF status. 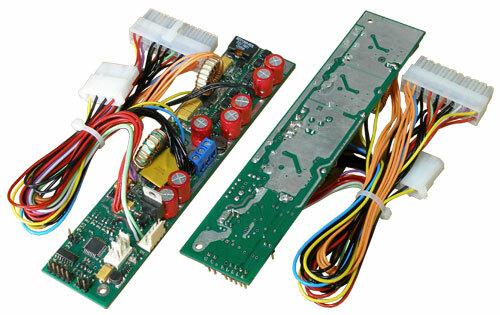 All power supplies provide 5Vsb (5V standby) so that the motherboard can issue at least a PSON signal. When the computer is in the suspend/sleep mode, it will consume even more power, because the RAM needs to be powered at all times. The power consumption in the suspend mode is few Watts. No matter how big your car battery is, it will eventually drain your vehicle battery in a matter of days. The DP024 is addressing these issues by cutting off the 5VSB rail after a pre-defined amount of time (timing settings). The DP024 monitors battery voltage to protect against deep discharge. When battery level drops below predefined value for more than predefined time, the DP024 will shut down and re-activate only when the input voltage is > predefined value. Operating as a thermostat with heating at temperature lower than 0ºC as well as automatic-fanspeed control of two fans for reliable cooling at high temperature together with teperature control from two sensors (remote and internal) allow to design fault-tolerant system with long-life performance. - Input voltage : +19~35VDC (nominal - 26V). NOTICE: Total current on 5Vsb and 5V rails does not exceed 6A. Do not connect a Car Battery Charger directly to the DP024. The DP024 should be attached and tuned by specialized personnel only after familiarizing with User manual Please take a moment and read this manual before you install the DP024 in your vehicle. Often rushing into installing the unit can result in serious damage to your DP024 converter, computer and probably your car electrical system. The DP024 has several wires that need to be installed in various places. When installing, always double check the polarity of your wires with a voltmeter. NEVER use the cigarette plug as a power source; often the contacts are not capable of delivering high current to your PC. Connect the IGNITION+ to the switched +24 Volt supply wire (“ignition” circuit or fuse box). Apply 24 Volts to IGNITION+ by turning on the ignition or by flipping a switch and you’re ready to go! NOTICE! It is desirable to connect the DP024 to 24V car electrical system via surge protector (shown hatched). This device should suppress glitches above 40V that sometimes occur in 24V car electrical system and should provide conducted immunity according to ISO7637. The DP024 can be tested in the lab before being installed into the vehicle. Certain details need to be noted for proper bench testing. When connecting bench power use between 24 to 32 Volts DC to POWER (+) and GND (BATTERY) (-) terminals for best results. The best way to do successful bench testing is to use an adequately sized 24V battery. Bringing in the battery from the car or using an extra one that has at least a 10-AmpHour capacity will be sufficient in most cases. To aid in bench testing, do not connect IGNITION+ anywhere. The DP024 will operate as “dumb PSU” with button “POWER” control.